Very easy to read, I love it!!! Great review of a great episode. By far my favorite 90-minute episode of the series. Thank you Matheus! It's a great episode! There's not much i can add that hasn't already been expressed elsewhere. It really is the textbook for how adaptations should be done. Eirik are you likely to ever do version comparisons when your episode by episode breakdowns are done, like comparing Ustinov’s terrible version of this with Suchets version, Finney's MOTOE with Suchets and so on? Haha! Yes, I could have discussed loads of other aspects of the episode, but I decided to go for brevity after the last couple of long episode-by-episode posts ;) Brilliant script! I have considered doing comparisons, but I must confess that I'm not much of an Ustinov-Poirot fan, so I have a feeling those comparisons would be rather biased! But never say never - it's still on my list of ideas for further posts! Suchet captures the look and mannerisms so much better than Ustinov. Now, that may be due to things about Ustinov's appearance he can't help, but on the other hand, Suchet looks very different in costume than out, which proves that some things can be done to change appearance. This "new ending" with Poirot approving final word (Bon!) killed the great adaptation! His approving is nonsense, honestly. I'd suggest in future you turn it off when the book stops and before the added scene. I was clearly joking with you. Honestly grow up, it's just a TV show. Removed cause by mistake (system bug), not cause I was anrgy, chill out and grow up yourself! I'm not the one ranting and raving and deleting things after people reply to them, then blaming my own mistake on a magical "system Bug". I didn't think you deleted it because you were angry or “anrgy”, you made the reply in anger, then deleted it. O, yeah, you see through me!.. Dude, save your great clumsy jokes and arrogant knocks, be polite and relax! Bonne chance! I'm bored of this now, so i will let you clog up the comments with the last word. It's so actually sad that you don't wanna hear something quite opposite for your dithyrambs. Oh, and I wanna alert you in advance that I hate the new version of the Contess Rossakoff that we all saw in the last episode. And I'd suggest in future you do not try blogging when the opposite opinions are so frustrating for you. Hi Sybarite! Since I'm the writer of this blog, I just want to say that I'm always open to hear dissenting opinions. I don't agree with your views (I'm an avid supporter of Suchet's interpretation of Poirot's mindset), but I value your opinion. That is half the point with a blog like this - to create an arena in which fans can read about and discuss the series we all love. The BFI Q&A session (or at least part of it) has been posted on YouTube where Suchet makes mention of and defends the new ending. Also included in this lengthy clip are two humorous anecdotes where Suchet (in full costume and remaining in character) encounters members of the general public. Thanks a lot! Great find! :) Some of the anecdotes are from Suchet's "Poirot and Me" book - a great read. Great read. I have always been fond of the adaptation of Dead Man's Folly with Peter Ustinov, despite its flaws. This episode has surpassed that, however. The direction and music were breathtaking. I'm glad you enjoyed the episode! And I agree, it's breathtaking. Very impressive. Ha ha, yes! I noticed that, too, and I'm not even Dutch. It was definitely overdone. Was there a version of this with Ustinov? Poirot's angrier and more moralistic attitude toward Mrs. Folliat, compared to the book, felt satisfactory to me. I think her behavior with regards to her son is a little ridiculous, and deserves the moral outrage. I felt that way about Simon Doyle in this series' Nile, too. Anyway, delightful to find this website! I often feel quite alone in the Poirot Fandom and it's nice to find so many others! I had a question for you; do you happen to remember which episode it is besides "Hercule Poirot's Christmas" that includes Christmas at some point? I know in the back of my mind that there is one, even if the plot doesn't revolve around it. Considering it's one of the later episodes, this is surprisingly faithful to the book but what a shame the butler isn't as artistic with the gong! Shouldn't Hattie have at least some hint of a Jamaican accent? One significant change not mentioned in the review is De Souza's arrest after Hattie's ring is planted on him. Good point! I'll go back and add the arrest to the changes (this was written shortly after the episode aired, so I must have left it out unintentionally. Dead Man's Folly was the only episode I hadn't read the book nor watched the adaptation, until yesterday. I do have some regret about watching it before reading the book, in spite of being a great episode. The music is fantastic and the place is just beautifully stunning. *SPOILER* When Sir George Stubbs brings Hattie home, we just have a glimpse of her face, but we don't really see her; immediatly I suspected that she wasn't the real Hattie. Then I was sure when she gets that upset because of De Souza's visit. I think it's pretty obvious for first-watchers, especially if you're a fan like me and get to know almost every Ol' Agatha trick. Instead, I like to think that I used my little gray cells. another unbelievably stupid impersonation plot by cristie, faithfully adapted for most part. it is one thing for her to run out of ideas, but only fans with their brains removed will not spot the many many holes in the whole story, and the absurd rehashing of all of the worst cristie clichés. even non regular viewers should be able to realize, before half way through, at least one person who was falsely pretending to be another. the changing of ending, which seems to imply that poirot actively encouraged a murder suicide, is unnecessary, and against the spirit of books where he is rather morally indifferent, and rest of the tv series, esp in later 'darker' ones, where he is shown to be piously catholic and highly moralistic. some of the other episodes in final season display a certain falling off in quality of production design that this series was known for (and justly praised for), but by restricting locations that particular new failing seems have been averted in this episode. that is the only good thing i can say about it, unfortunately. It’s true that the Lodge is not used much in this episode other than being where the hitch-hikers are dropped off at the entrance to Nasse / Greenway and it does probably make more sense to use the Boat House as it is a much more atmospheric building. After the initial views of the front of Greenway, I was completely perplexed when the next views of it (at the fete) were on a large lawn in front of the house whereas the lawn in front of Greenway drops dramatically down to the River Dart. Living in Devon, I am relatively close to Greenway (Christie’s summer residence) and know the building and estate reasonably well and therefore assumed the producers had done some really clever CGI jiggery-pokery in order to make the house appear behind the lawn - but then realised it was a different building altogether (although almost perfectly matched in style). After doing a bit of searching on-line, I finally found that this other building is in fact High Canons in Borehamwood (Hertfordshire) - which has been used for some other classics including "The Avengers", "Randall and Hopkirk (Deceased)" and the very camp Vincent Price film, "Dr Phibes Rises Again”. The scenes on the staircase (where the false Hattie Stubbs is taken upstairs) and the scenes in the Library were also filmed at High Canons. A very clever feat of continuity in order to make this work so seamlessly. can anyone tell us who played the real hattie stubbs seen once on the stairs? I've been rewatching the series after not having watched it since it ended in 2013. I only saw Dead Man's Folly once when it was first shown but have now seen it in again twice. I didn't enjoy it the first time and sad to say it has not grown on me one bit. Everyone has different tastes and ideas about what they find watchable and I'm not sure why I don't like it as it has a good cast and a pretty setting. 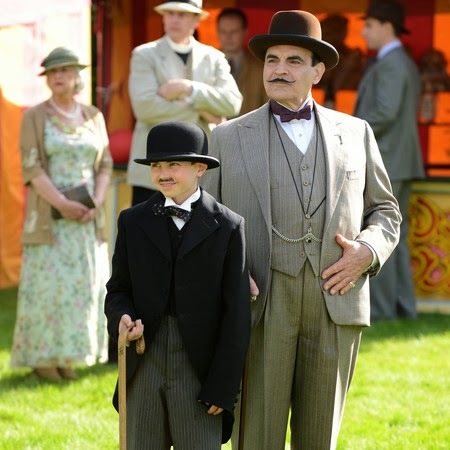 Possibly it's that the series was all but ended by this one and that (inevitably) Poirot looks much older. The fact that one of the victims is a 14 year old girl whilst another is a vulnerable young woman who probably has a learning disability doesn't help either.